Join us for the Animal Flow® Level 1 Workshop in Christchurch, New Zealand on February 9-10, 2019. The two-day event is six hours each day: Saturday and Sunday, from 10:00am to 4:00pm. at the Les Mills Christchurch City club. L1 is an intensive two-day workshop (12 hours total) where you’ll learn all 30 Level 1 moves, including regressions, progressions, and variations for all skill levels. You’ll explore how and when to use each movement individually, as well as how to link them together into flows of your own design. This is also your first step toward becoming an Official Animal Flow Instructor or Specialist. You can find the details on the test-out process and benefits HERE. The Level 1 course is approved to provide continuing education credits from: New Zealand Registered Exercise Professionals (REPs) 13.75 5 CPDs; National Academy of Sports Medicine (NASM) 1.1 CEUs; Athletics and Fitness Association of America (AFAA) 11 CEUs; UK Registered Exercice Professioanla (REPS) from PD:Approval 10 CPD; UAE REPS; Canfitpro – 8 canfitpro CECs (Assesement & Exercise Portion: 4 PTS; Program Design Portion: 4 PTS); Fitness Australia – 9 CECs pending renewal; Physical Activity Australia 3 PDPs. 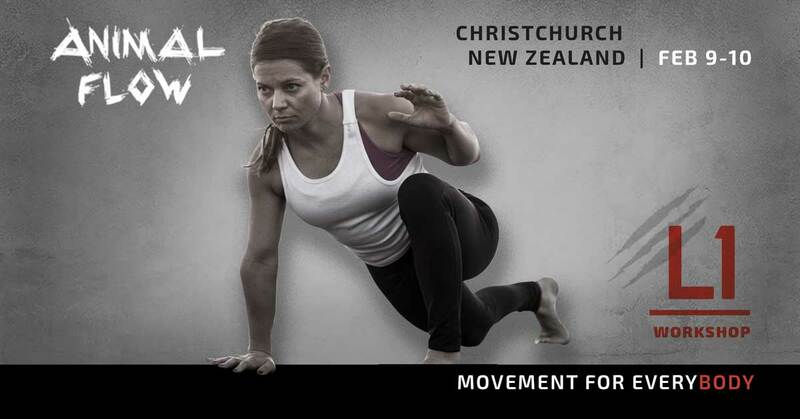 The event will be hosted at Les Mills Christchurch City, in the Christchurch CBD. Regular cost for the Level 1 Workshop is $475 USD (Currency conversion applied at check out. Approx 720 NZD) Early Bird pricing of $425 USD is available until January 1.